There are a few multiple propeller bags out there. They are either extremely expensive, or designed in a way that doesn’t protect the propellers tip, missing the entire purpose of a propeller bag. Looking at what is available out there it became evident that a new design is needed. 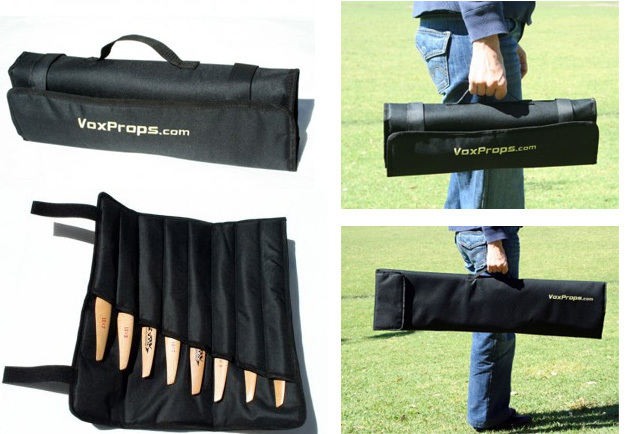 Vox propellers offer a high quality double padded propeller quiver bag, made of strong durable canvas on the outside and smooth fabric on the inside. The Vox quiver bag is closed from all sides so the propellers cannot slip out by mistake, yet you can easily insert and remove them. The bag holds 4 propellers up to 33” in length and is sold at introductory price of only $19.95 instead of $24.95 Give it a try – you won’t regret. The bag holds 8 propellers up to 16” in length and is sold for only $14.95. Give it a try – you won’t regret.